I will never buy another exotic cat unless sits through A1 Savannah, Martin and Amanda are devoted to breeding quality cats with their knowledge of Serval and hybrid breeds. I had purchased a Serval kitten from a “cat mill” and upon bringing the beautiful animal home, it was like having a Serval picked up in the wild. I had called Martin and Amanda because I simply could not accept this feline into my home, and even in evening hours they waited for me to gather the Serval and drive it directly to them as it was also not eating. They accepted this wild cat into their home and spent the time to domesticate it with their knowledge and love; In and of itself was impressive, and within a couple months the Serval (Zuri) was a changed animal. 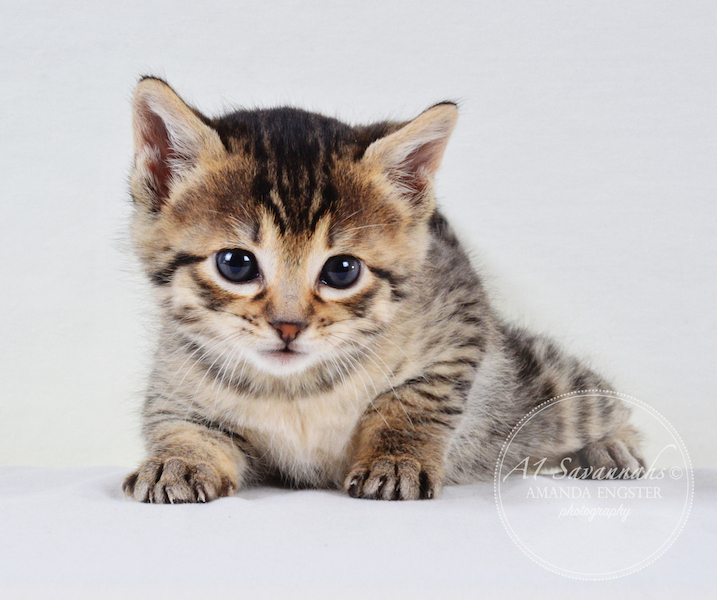 Martin and Amanda assisted in selecting the correct cat for my home, offering one of their adorable F3 Savannah kittens. The wait time was more than worth it, and upon going to pick up F3 Elsie, I was again impressed. Elsie was very personable, inquisitive, and of course very playful. I was handed tons of information on her as well as taking care of her, and if I needed anything or had any questions they were a phone call away. Elsie has been amazing, she is very personable and greets new people with a verbal greeting and conversation. She gets along with my young children, other cats, and even the dogs. Elsie is a lover and conversationalist and doesn’t play often but prefers to play with the other animals and kids, very rarely will she play with any of her vast assortment of toys. It took some time to get to know how she communicates as her meow is quite different than other cats and I feel now that everyone in the house can speak Savannah. Elsie believes no human should be left alone, if you’re sitting alone she then is on your lap talking to you and enjoying her cuddles. She also falls asleep at the foot of the bed until you’re sleeping then she patrols the house causing mischief or watching the fish in the aquarium. We have learned not to leave scraps of food around and to be careful when cooking as she will take a piece of meat faster than you can blink an eye, run away and hide it for later. Elsie is rather small and can make an 8’ vertical jump like its nothing making some of her “acquisitions” a challenge to retrieve. The entire crew at A1Savannahs took the extra care and time to raise these kittens from birth to be prepared for their forever home. Im thankful for everything they do because the transition for this beautiful girl into the home was simple and seamless. I have an amazing and loving cat because of the care that was taken during her critical time of development and her warm welcome into the world of living with humans. I always recommend A1Savannahs to anyone without hesitation and this is one of the best cats I have ever owned.